Call it apathy, indifference, a lack of desire, or whatever other word you want to use, it doesn’t really matter. Bottom line is the New York Mets didn’t lose this weekend, they beat themselves. The Mets had a golden opportunity Sunday night as they hosted their cross-town rivals, the New York Yankees, in what was unquestionably the biggest ‘Subway Series’ the two have played since 2000 when they faced off in the World Series. Both teams entered the weekend firmly in the playoff picture for the first time in a nearly a decade as the Mets hold a comfortable lead in the NL East while their nemeses stand atop the Wild Card standings in the American League, trailing the Toronto Blue Jays in the AL East by only 3.5 games. Having split the first 2 games of the 3 game set, the final game played on Sunday Night Baseball in front of a national audience, the Yankees were able to come away with an 11-2 victory, taking the series 2-1. With the win, the Yanks also took the season series with the Mets (4-2), and moved up to only 2.5 games back of the division lead. Yanks starter CC Sabathia looked like a new pitcher, tossing 6 innings while only giving up 1 earned run, while Dustin Ackley and Greg Bird smashed a 3-run homer a piece. The Bombers left Queens with a ton of momentum as they travel to Toronto to take on the Blue Jays, a series which will probably determine the AL East. However, the Yankees success isn’t the point of this article, nor is it the biggest take away from this weekend. The reason for this is it was not the Yankees who won but the Mets who lost. The Mets had a real opportunity to make a statement in this series. Since their creation over 50 years ago, they have always played in the shadow of the big bad Bronx Bombers. This ‘second fiddle’ status is part of a Mets fan’s identity, constantly feeling like the ‘Jan Brady’ to the Yankees’ ‘Marsha’. This underdog status has led to a little brother, big brother situation between themselves and the Yanks, as the desire to usurp them as New York’s team has been the cause of both their depression as well as their unity. No one can deny the passion of their fan base. So with the bright lights on, a national TV audience tuning in, and their ‘Dark Knight’ Matt Harvey on the mound with the fate of Gotham’s bragging rights in the balance, the Mets showed their true colors. Harvey, the man who has stated he wants to be the next ‘Derek Jeter’ heralded by NYC, pitched one hell of a game. He allowed 1 hit and struk out 7 batters through 5 shutout innings, but was removed before the 6th inning of a tight 1-0 game in a previously decided effort to limit his innings. Per his agent Scott Boras’ request, and with no real objections from Harvey himself, the Mets have decided to basically turn their ace into a spot starter, pitching a couple innings and skipping starts until the end of the season. So even though he had not pitched in 12 days, had thrown only 78 pitches, and had shut out their hated rivals through 5 frames en route to a series win over the Yanks and possibly ending their chance to overtake Toronto to win the AL East, Harvey was taken out of the game. Harvey put up no fight, accepted his coach’s decision, and handed the ball off to his bullpen, which proceeded to give up the lead immediately as the Yanks plated 2 runs before putting up another 9 before the game had ended. Yankees win, Mets lose, the status quo remains. Now I understand that the Yankees needed this win far more than the Mets. 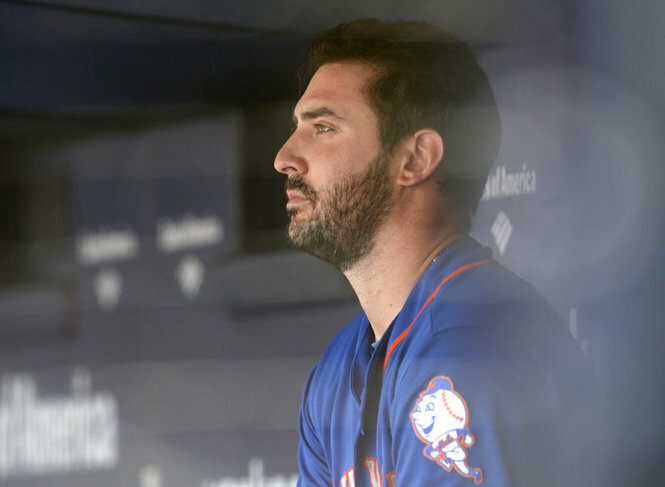 Harvey, coming off of Tommy John Surgery which kept him out of the entire 2014 season, is allowed to err on the side of caution when it comes to overworking himself in his first season back. However, for a player who relishes the spotlight, wants the headlines, and claims to be the second coming of Jeter, Harvey made the ultimate anti-Jeter move by leaving the game. Ask Yankee fans or Mets fans alike, had the tables been turned, Jeter would not have allowed himself to be pulled from a game of this importance. No way. A true ‘gamer’, as Harvey claims to be, would have tried to talk Terry Collins out of pulling him, would have made a scene about being yanked from a game he had dominated, and would want the ball in his hands to try and shut up the Yankees and their fans and let the world know who the best team in the city is. But he didn’t, and the Mets lost. The blame on this loss isn’t on Harvey alone, but on the coaching staff as well. Manager Terry Collins could have asked Harvey to go another inning or two to avoid their awful middle relief to get to their strong back end of the bullpen. He could have thrown the ‘Boris doctrine’ out the door and told Harvey to saddle up and get this win. In the grand scheme of things, this loss isn’t a huge deal for the Mets. They still have a comfortable lead in the NL East and, barring an epic collapse, will make the playoffs for the first time since 2006. They have a tremendous young pitching staff and should only get better in the years to come. If the Yankees should falter in the future (or the Mets make some real noise this postseason) New York bragging rights could easily leave the Bronx and take the 7 train to Queens. But the Mets, for the first time in really 15 years, had a chance to re-write the script, to take the eye of the city, and the country, and claim on national TV that they, not the Yankees, were New York’s team. The time of the aging Yanks was over; the young bright Mets were the team of now. They had a chance to put aside the ridicule they have heard for so long, the mocking of their franchise and how its run in comparison to the ‘unholy’ Steinbrenners of the Bronx. But they didn’t and the Mets lost.